I am very pleased to announce that I will soon be offering personalised photo albums to the Looney Lizard Creations family. My intention has always been that I would be adding additional handmade items to my range but due to the success of my personalised handmade luxury greeting card range, it’s taken a little longer than expected (OK quite a bit longer!). But behind the scenes these are now almost ready for release and should be on the site at the start of October 2013. There will initially be a small selection of designs to choose from as well as bespoke designs available upon request as well as custom colour requests for the designs available. I have even already undertaken a bespoke request for an album which can be seen below. All albums will be 15cm x 23cm and contain 30 pages with protective interleave. This will allow for 30 photos or 60 if you wish to use both sides of the page. The album itself is covered in white mulberry textured paper and will come with a matching plain box to keep your album and photos safe. These albums would make a great gift for a special birthday, wedding or anniversary. They would also be the prefect way for proud parents to document baby’s first year or perhaps their christening. I do hope you like them as much as I enjoyed creating them. 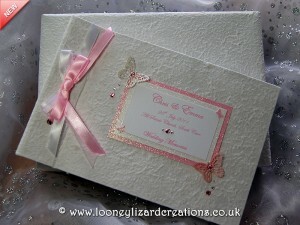 This entry was posted in Looney News and tagged wedding card, Swarovski, anniversary, handmade, news, newborn, personalised photo album, photo album, gift on September 25, 2013 by Sherrie.